We’ve been using Excel spreadsheets to collect employee hours and track payments. Each workbook had to go through several people before they are confirmed for payment. The logistics of this approach had started to prove challenging and we’ve been spending too much time correcting user errors and passing spreadsheets around. We were looking for a solution which will allow us to do this from a centralized location and help us go through the approval process in a more streamlined fashion. A leading event organizer and AV equipment supplier. Provides all necessary logistics, crew, and support for events. Also employs temporary and local workforce. Timesheets are created and collected in Excel, resulting in too many files to manage. Internal approval process makes the logistic of transferring workbooks hard. Data must be extracted in a very specific structure for the payment system. Audit trails must be easily accessible. 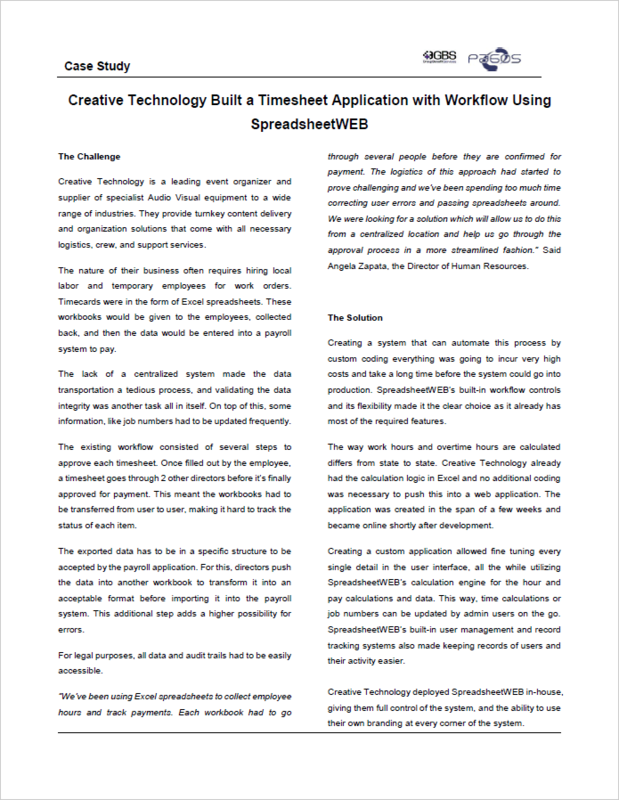 SpreadsheetWEB’s built-in workflow controls cut down on development effort and costs. The solution is hosted on the client’s own server. Hourly rates and calculation logic for regional differences were already in Excel and required no additional work. A centralized platform where workflow and data collection can be accessed together. Scale-able and customized solution makes it easy to update data and application UI. Data can be exported in any format and structure. Approval and correction processes, as well as user notifications are fully automated.